'Othello' runs through Sunday, Sept. 25, at Forest Meadows Amphitheatre, 890 Belle Ave., San Rafael. 415.499.4488. marinshakespeare.org. 'The most surprising thing about this whole process for me," says actor Dameion Brown, who's playing the lead in Marin Shakespeare Company's new production of Othello, "is hearing all of these amazing actors I'm working with, these incredibly experienced professionals, look me in the eye and say, 'You belong here. This is your place. This is your home.' That's been the biggest surprise. "I also got another surprise last night, during dress rehearsal," he adds with a laugh, "when I realized how hot a Shakespearean costume can be!" Taking on what is believed to be one of Shakespeare's most difficult roles would be considered a challenge for even the most seasoned of actors. Not only has Brown never acted on a professional stage, he's got just one stage performance to his name. In May of 2015, he played Macduff in a production of Macbeth. 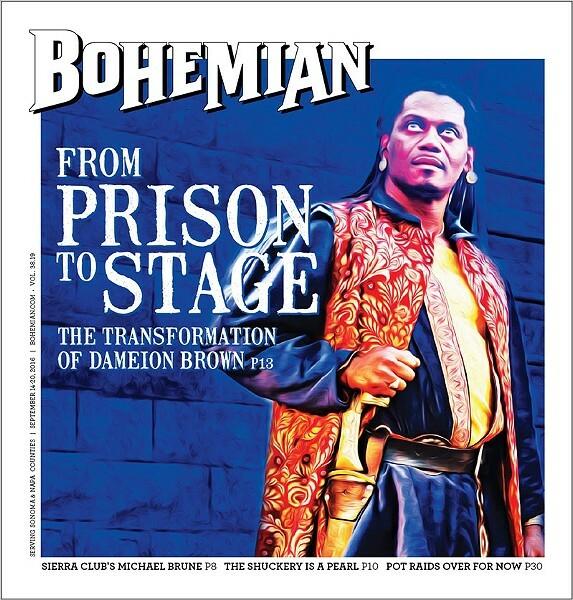 The one-time-only production was held inside California's medium-security Solano State Prison, where Brown was then incarcerated, an inmate of the correctional system since the age of 25. He is 48 now. "Theater is about transformation," says Robert Currier, artistic director of Marin Shakespeare Company (MSC), and the director of Othello. "Actors transform themselves into characters, and that can be an incredibly healing thing," he says. "It transforms the actors and it transforms the audience, who see people in ways they've never seen—and as part of that, theater eventually transforms the world, one play at a time." For more than 12 years, MSC has been conducting Shakespeare workshops in California prisons as part of its Shakespeare for Social Justice program. Overseen by Lesley Currier, managing director of MSC, the prison project currently operates workshops and stages plays, performed by prisoners, at several institutions, including San Quentin, Solano, Folsom Women's Facility and High Desert State Prison. This, says Lesley Currier, is the first time one of the program's participants, after being paroled, has been cast in a role during Marin Shakespeare's summer season of shows at the Forest Meadows Amphitheatre on the Dominican University campus in San Rafael. It's one of many firsts that the company and Brown are experiencing together this summer. Along with his first time performing alongside professional actors, the long-imprisoned Brown recently took a dip in a pool during a cast party to break up a long day and night of rehearsals. "That was the first time I've gone swimming in 26 years," he says. "It felt good." Brown first encountered the Curriers after signing up for the workshop, which he learned about from a flyer posted in the prison. At the time, he was in the 22nd year of his life sentence (with possibility of parole), following his 1993 conviction for a number of violent offenses against his family and children. After years of self-education and a long effort to come to grips with the harm he'd caused the people he loves, Brown says he was ready to dig deeper, but had no idea that the opportunity would come through an acting class. "I saw the flyer, and I really thought it was some kind of short-term workshop, and that would be the end of it," Brown says. "It was something to do. I signed up for the class out of curiosity, with no expectation that I would end up cast in a play or that it would end up sparking the kind of transformation journey I've been on ever since." The class, conducted by Lesley Currier, consisted of a variety of acting exercises. Brown admits that they seemed "weird" at first, so alien and contradictory compared to everyday life in prison. "Ultimately, it was an opportunity to laugh," he says. "To laugh at oneself and to laugh at someone else, without anyone taking offense. It was amazing, and it lightened up the environment in which we all lived." Previous to that, Brown's only experience with acting was in school, back in Jackson, Tenn., where he grew up as one of 12 children. In middle school, he was cast in a production of Othello, but the show never took place. "I'd gotten the lead," he says, "and I wanted to play the part and we were going to perform it, but then there were divisions amongst the adults—the black and the white adults. Being in the South, some parents did not want their daughter intermingling with an African-American man, and some African-American adults did not want a young black man intermingling with white people's daughters." Brown says he never forgot his brush with Shakespeare, and he remembered it as he committed himself to the class at the prison. Expecting little more than a series of exercises and perhaps the performance of a scene or two, he was surprised when Currier announced that she would be auditioning the participants for a production, to be held at the prison, of Shakespeare's Macbeth. "I'd never really acted before, so I asked for a very small role," Brown recalls. "I didn't want to shoulder the responsibility of anything large. So of course, Lesley gave me the part of Macduff. "That," he says with a laugh, "was a heavy load." What followed was a period he now looks back on as some of the hardest work he'd ever done in his life. "It helped that the men who were in the play were very serious about getting it done," Brown explains. "That camaraderie, that sense of 'We need you,' 'We're in this together,' 'If you're there, we'll be there'—that thing took over, and it became a family, in a sense. "Family is not smiled upon in prison. There are different gang members, different races, who would otherwise not interact in this manner. But because of the play, and our common interest in creating the best play we could do, all of that other stuff went out the window once we were in that room together, during that time. It was beautiful." The play, in which Scottish warlords fight for territory and Macbeth becomes addicted to violent action, gave the cast an opportunity to talk about the part violence had played in their own lives. The day of the performance, he says, was incredibly emotional for all of them.